Two hot words today: Social Justice. It’s become a big part of Church culture. I’m not here to bash this issue or say it isn’t important, isn’t validated in scripture, or that it doesn’t matter to me. But I am here to bring some clarity and focus around the issue. As Christians, we can be pulled in so many different directions when it comes to Social Justice. Well, we could get involved with human trafficking, sidewalk counseling at an abortion clinic, helping battered women and children, sponsoring children in other countries, feeding the homeless, and the list goes on and on. I believe the Lord does lay these social burdens on his people’s hearts, and some are called by Him to strongly pursue one or more of these endeavors. I’ve even been involved with a few of these ministries myself. Yet, as we run down one of these roads we must make sure we aren’t running away from the cross, but that our road is running to it. It’s easy in Church culture to substitute the myriad of ministries with the Gospel. We must not let a ministry that is important to us cloud our vision of the Gospel. Church ministries are not the Gospel. 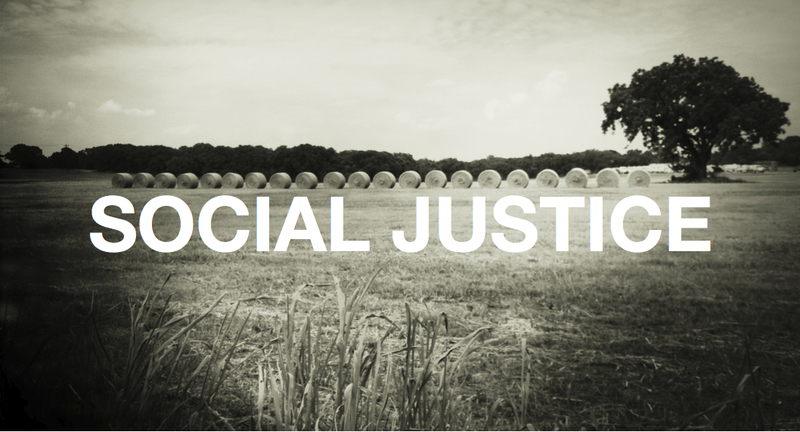 Social Justice is not the Gospel. These might be avenues towards the Gospel, but they are not one and the same. The Church (the body of Christ) should be all about the Gospel. However, each local church body can explore different ministries to express this truth. Every good story has a strong climax. This is the part where the protagonist (main character) has to make a decision that affects the rest of the story and the final outcome. The Bible is not exempt from this type of storytelling. In fact, everything in the Old Testament points to the climax in the Bible. What is it? Jesus choosing in his manhood to die a brutal death on the cross and then proving his Godhood by rising from the dead. This is the focal point of the whole Bible, so it should also be the focal point of our lives and our ministries. In Mark 2:1-12 Jesus is speaking to a large crowd of people, a crowd so large that four men had to lower their paralytic friend through the roof of the house just so Jesus could see him. The first thing Jesus does is tell the man that his sins are forgiven. Why? Jesus knew it was more difficult to be washed clean from filthy sins than to heal bodily ailments. He also knew through the power of his death and resurrection he would be able to give that man a much greater healing; healing from sin. He offers the same to us today. Every church ministry and social justice issue should be about the great healer who gives forgiveness of sins. Yet, Jesus didn’t deem the mans paralyzes as unimportant either. Jesus was establishing his credibility to heal based on his authority as the Son of God. He still healed the lame man. He took care of his soul and also his body. Let us do the same for others. Previous Post Can We Really Have It All?